Brand New Twin Site Lights Heavy Duty Twin Work Light, Made from a tough cast aluminium housing, protective bulb shields with steel bars. Telescopic tripod, extends from 1.3-1.9m high. IP54 rated. 78mm 500W halogen bulbs. 2.4m power cable. 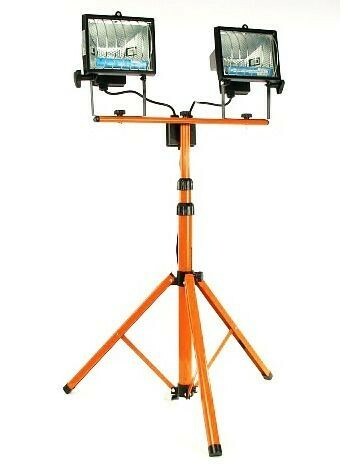 The Twin Work Site lights are ideal for construction and garage based work, However they can be just as effective with Photography purposes. Please note: The colour of the product as shown may vary.